Heat 2 tablespoons of oil in a very large non-stick skillet over medium. Add the onions, chiles, garlic and tomatoes, raise the temperature to high and cook until most of the moisture has evaporated, about 3 minutes. Add the scallops, stir to incorporate, reduce the heat to medium and cook for 2 to 3 minutes until the scallops are no longer translucent. Taste and season with salt, usually about ½ teaspoon. Remove from the heat and cool. This filling mixture should be dry enough to hold together. While the oil is getting hot, spray or brush the tortillas with a little oil, slide them into a microwaveable plastic bag and fold the top over but don't seal it. Microwave the tortillas on high for 1 minute, remove from the microwave and let stand a couple of minutes before opening the bag. When the tortillas are cool enough to handle, lay them out 3 at a time and scoop about 2 tablespoons of mixture in a line down one side of each tortilla. Roll each tortilla snuggly around the filling, then slide in a skewer to keep them from opening while frying. When the oil is hot (at the right temperature, the taquito will sizzle vigorously when slid into the oil), fry each one until golden brown, 2 to 3 minutes. (Only fry as many at once as fit comfortably in your pan.) Remove and drain on paper towels. Repeat until all of the tacos are fried. 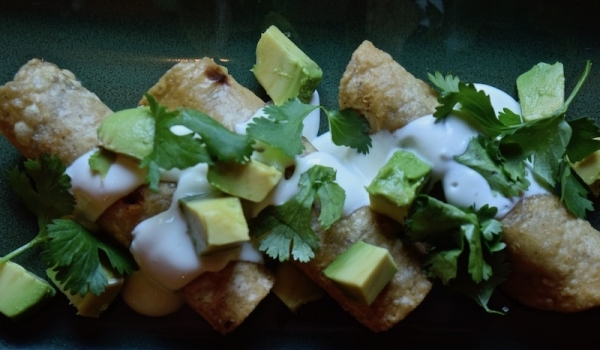 Immediately arrange them on a platter and top with spoonfuls of crema, avocado cubes and cilantro leaves. Serve immediately because these wait for no one.